IPAC'15 proceedings are now available. 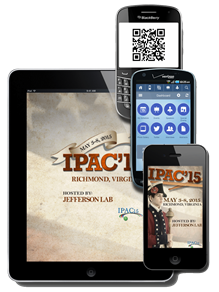 The Official IPAC'15 Mobile App is an excellent resource to check out all the information on the conference and is compatible with Android, IOS, Blackberry, and all the standard Desktop Web Browsers. Welcome to IPAC'15, sponsored by the Institute of Electrical and Electronics Engineers (IEEE), the American Physical Society (APS) and hosted by Thomas Jefferson National Accelerator Facility (Jefferson Lab). 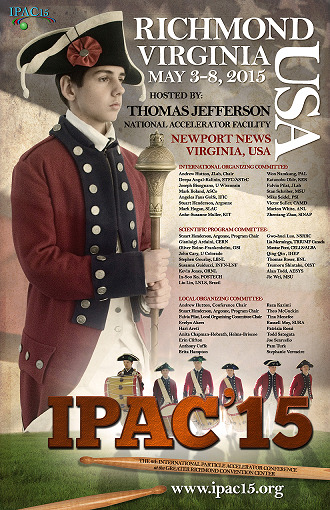 IPAC'15, the sixth International Particle Accelerator Conference, will be held in historic Richmond, Virginia, USA from May 3-8, 2015 at the Greater Richmond Convention Center. The Greater Richmond Convention Center is located in the heart of the city, near hotels, shopping, restaurants and other attractions. As the largest meeting and exposition facility in Virginia, covering more than five city blocks, the convention center is experienced at welcoming and supporting visitors from around the world. Richmond offers a pleasing mix of old and new, historic architecture and modern cultural attractions, and much more. It is the capital city of Virginia and former capital of the Confederacy, providing a unique historic profile stretching back over 400 years. Beyond its historic appeal and sites, Richmond offers a full range of upscale shopping, unforgettable restaurants, world-class museums, and numerous outdoor and family attractions. More than five million visitors come to the Richmond area each year. At IPAC'15, you will have the opportunity to meet and interact with Accelerator Scientists, Engineers, Students and Vendors while experiencing the Southern charm and hospitality of our host city. Jefferson Lab, the host for IPAC'15, is also well known to world travelers. Located about one hour from Richmond in Newport News, VA, Jefferson Lab is a world-leading nuclear physics research lab funded by the U.S. Department of Energy. It is our goal to make IPAC'15 and your participation a memorable event.